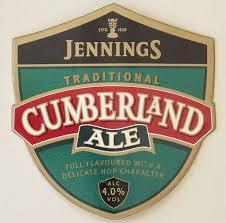 I received a few ales for my birthday, what a surprise, and among them was a couple of bottles of Cumberland Ale. I’ve had this before several times in the past, in bottles and on a pump in a bar just around the corner from Kings Cross and every time I’ve found it to be very tasty. It’s fairly light in taste, what some would describe as a delicate palette, and unlike some beers it’s actually really difficult to describe. It has a very slight bitter aftertaste, but there again that’s not a problem for someone like me who doesn’t like bitters or ales that leave you needing something sweet to cleanse the palette. You can drink a couple of these and not feel as if you’ve been sucking on a lemon. It’s very smooth, a bit malty, at 4.0% it’s not heavy and is slightly amber in colour and sort of golden as well with a slight head. Overall it’s a really nice easy drink which some might find boring, but I really enjoy it and will always go for it if I see it on the pump. Other flavours I’ve not noticed but are mentioned are apple and biscuit so I’ll have to look out for them next time I have a pint! Cumberland Ale won silver in 2009 and bronze in 2010 at the International Beer Challenge and it’s a favourite as it’s stocked nationwide. Jennings have been going for 185 years and despite having not been to the brewery I think I’ve tried all of their core range, except for the Bitter. If I’m ever up that way in the Lakes I’d definitely pop in to take a tour and pick up a couple of bottles or ten. I’ve been to the Lake District lots of times on holidays but it’s rare that I go that far north in the area so at some point I’ll have to make a special journey. Have a look at their website and if you are up that way, or are coming down from across the border, pop in and take the tour.